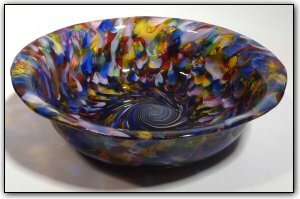 This bowl is from the End Of Day® series, meaning it is made with a variety of colors used throughout the day, contains nearly every color in the rainbow. To help the colors stand out and to make them even more deep and intense, a technique was used to add a very thin layer of white in the middle of the inner color and outer color, making the colors just about jump out of the glass. Make sure to zoom in to see just how deep and vibrant the colors are! **SPECIAL SHIPPING NOTE** Our shopping cart charges a flat rate $40 shipping on all items. However, this bowl is smaller and will only cost $20 to ship. We are currently unable to edit the flat rate amount, so upon receiving your payment with the standard $40 S&H we will send an immediate refund $20 to account for the discounted shipping on this item.